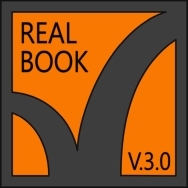 The Realbook (v.2.2 and above) includes the hardcover that can be easily modified parametrically. In this sense it should be seen the choose of the three cubes for realize it. In the same prospective I realized the flat projection that follow the front and back cover pages. Apply two images to the hardcover is a joke, but in the border it is not possible to have any detailed texturing. if you want to use an UVW mapping on it you need to manipulate a little bit the setup. You can obtain a perfect texturing and also you can manipulate the shape of the hardcover. Just, after you have chosen all the parameters referring to the book dimension (number of pages included) make a copy of the Cover Base, Cover Front and Cover Post, make them editable and child of the source cubes like you can see in the screen below. Don’t forget to disable the parents. Now you can modify the three model parts and create you own material.